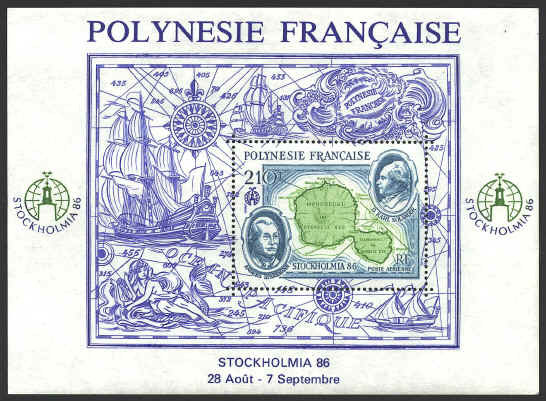 Swedish botanists Dr. Daniel Karl Solander and Anders Sparrman (the stamp has an extra “n”), are commemorated on this souvenir sheet from French Polynesia. Solander visited the island on James Cook’s first voyage in 1768, and Sparrman accompanied Cook on his second voyage in 1772. Sparrman is also honored on a Swedish stamp (1006). Both men were students of Carolus Linnaeus, who originated the scientific system of plant classification. The map on the stamp is not identified, but it is possibly Cook's.